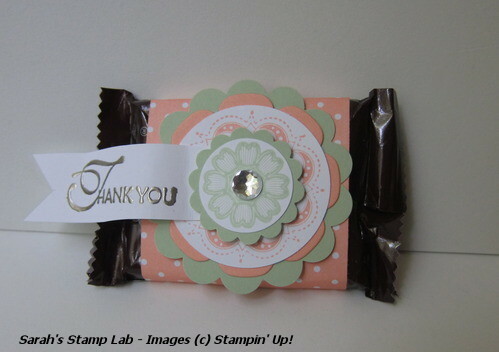 Today I am sharing a little favor that I made for my recent Lacy & Lovely class. This is based on a favor that I had seen on Connie Babbert's blog. I made it a little wider to accommodate two little Hershey bars and I changed all of the colors because I was dying to play with the new In Colors. I love pairing up Pistachio Pudding with Crisp Cantaloupe. This is simply adorable! I just love the pistachio color wit the cantalope. Love this! the colours are great. I think this year I'm going to try to make some of these for Christmas.